“I’m looking for Yankees!” the man said. Toward the end of the video, the man yelled at the soldiers. “No!” one of them yelled back. Alice Gachuzo-Colin turned her back to the float when she saw it. The float belonged to the Arkansas Sons of Confederate Veterans, according to KNWA in Rogers, Arkansas. The group’s president, Trip Wilson, described it as a patriotic organization. “In Arkansas, we take particular interest in the preservation and marking of Confederate soldiers’ graves, support of historical re-enactment efforts, education of our young people and attendance at regular meetings to discuss the military and political history of the period,” the group’s web page says. The comments about the video show that some people were confused — “Was it a history parade ? (I’m) not sure I get the connection to a Christmas parade” — angered and defensive of a group they said does good deeds for the community. The Downtown Springdale Alliance told KNWA that though it didn’t organize the parade, it did not condone the float. 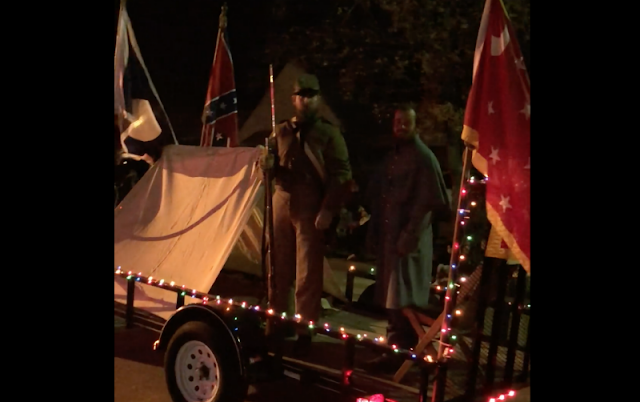 “The November 24th Christmas Parade of the Ozarks float featuring the Confederate flag and soldiers was not approved by DSA, nor is its message condoned by our staff or board of directors,” the group said in a statement to the TV station. The parade’s sponsor, Rodeo of the Ozarks, told the Democrat-Gazette that participants can register ahead if they want their floats judged, or just show up on the day of the parade. Participants have never been vetted, Sach Oliver, a member of the rodeo’s board of directors, told the newspaper. He said board members had not discussed how to handle what happened on Saturday. Gachuzo-Colin told KNWA that she had been enjoying the parade, up to that point.